This month we have Neptune and Mars changing directions and other planets moving into new signs of the zodiac! We are being asked to slow down our forward movement and make some new plans. But first, let us discuss the Numerology Vibration for this midway point of 2018! The month of June is the 6th month, and so the halfway point, of this year. It vibrates to a 17 in Numerology (2+0+1+8+6 = 17). By adding the 1 plus the 7 we get a reduced numerology vibration of the number 8. The number 8, on an earthly level, rules career, business, money, finances, power, control, and authority. These areas of life will be highlighted for the month. There may be power and control issues with other people or in the collective of humanity. Big business and corporations may be in the news. Those in authority positions, such as in the government, may also be in the spotlight. The number 8 on a spiritual level is about empowerment! This is an opportunity for individuals on the planet to become their own authority and take their power back, from people as well as situations, circumstances, and belief systems that are disempowering. The 17th Major Arcana in the Tarot is The Star. This is a very hopeful vibration. It is ruled by the sign Aquarius and, after last month’s vibration of the destructive Tower card energy, it provides a more optimistic view of the future. Aquarius rules Universal Energy or the God Mind and is the Creative Light or Inspiration for positive changes to occur. This is about the power of our dreams when given positive intention and action, to become our new reality. 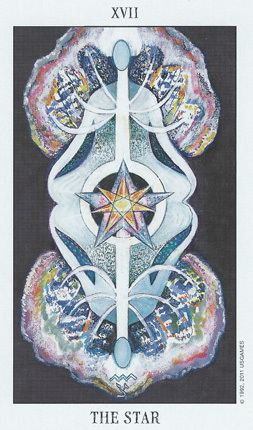 In the book, Essence of the Tarot, by Megan Skinner, it says, “This path encourages us to transcend our limitations and to connect to a higher purpose and vision, not only for our own sake but ultimately, for the sake of all humanity.” So, be the Light of the Shining Star and expand your vision, opening yourself up to the infinite number of possibilities that lie before you. Mercury and Venus seem to have the most activity this month! The first astrological energy of significance happens on June 1st. Mercury, planet of the mental realm, currently in his home sign of Gemini, is creating a positive connection with Mars, ruler of energy and action, now starting to slow down his movement in Aquarius. This is a very motivating aspect for new thoughts, new ideas, and positive communications with others. It is a good time to network and attend meetings with those of like mind. Also on the 1st, Venus, ruler of love and beauty, in the nurturing sign of Cancer, is positively connecting with Jupiter, planet of expansion, in the deep waters of Scorpio. This is very empowering for the Divine Feminine Energy on the planet and in our personal lives. It can also have an expansive effect on money matters, with either more money coming in or going out. On June 2nd Venus connects with spiritual Neptune in a positive connection. This brings in the idea and feeling, of unconditional love and compassion for others. It is an aspect where we can fall in love with love. On the 5th, Mercury connects with the Sun in Gemini creating a more inquisitive nature, the ability to learn new things, network, and have positive communications with others. Venus also opposes transformative Pluto on this day. We may be healing our sense of self-worthiness, or a family dynamic, or this can reflect the Divine Feminine in the collective of humanity rising into her power through situations and events that are occurring. Mercury challenges Illusive Neptune on June 6th so we may be confused on a mental level, not expressing ourselves clearly, or not understanding what others are communicating to us. On the 7th it is the Sun’s turn to challenge Neptune so we may not be seeing ourselves clearly, or we may feel a little ungrounded and/or lacking in physical energy. On June 12th Mercury, the Messenger, moves into water sign Cancer and our communications are more focused on home and family matters, or with those that we feel an emotional connection to. We are also better able to express our emotions with others when needed. This brings us to the New Moon at 22 degrees Gemini on June 13th. The two days preceding this lunation, called the Dark of the Moon Phase, the Sun and Moon will be in a challenging quincunx aspect to mighty Pluto, which will be a time of healing disempowering thoughts on a subconscious level that may be holding us back from a brighter way of experiencing life and/or expressing ourselves. After the New Moon, it will be a time of new beginnings and we will be able to settle into a new way of thinking and communicating. Also on the 13th, lovely Venus moves into creative Leo, the Lion. She will feel more attractive and be more fun-loving and generous while in this sign, where she will be until July 9th. The next day, however, she will create a challenging aspect to Uranus, the Rebel, in the sign of Taurus the Bull. There may be a situation where she (Venus) needs to break free, causing some upset in relationship or money matters. Mercury, ruler of the mind and speech, opposes restrictive Saturn on June 15th. This may create a struggle or challenge in communications with other people. On June 18th Neptune, ruler of the spiritual realm, turns to retrograde motion at 16 degrees Pisces. The few days preceding, and after, we may feel more energetically sensitive. This sensitivity may be to food, drink, chemicals, and the energies of situations and others. It may also increase our psychic perceptions, our meditation experiences, and our feeling of being ungrounded. Neptune will be retrograde until the end of November 2018 so this is a great time to connect with your Spiritual Selves and to the Universal Oneness of All That Is! Between June 19th and 23rd, Mercury, ruler of our perceptions, connects with Jupiter, planet of expansion, Neptune, planet of the intangible, and Pluto, planet of transmutation. This can bring about a deep subconscious healing as we look at things from a different perspective and tap into a higher realm of spiritual energy. On the 21st, the Sun moves into Cancer for the next approximate 31 days, again shifting the focus more to home and family matters, and the emotional connections in our lives. The lovers, Venus and Mars, are also opposing each other on this day which will bring more interactions with the significant others in our lives. It may also be a time where we have the potential of meeting a new romantic interest. Venus squares Jupiter on the 25th which may challenge our belief systems regarding relationships or bring in some dis-empowering circumstances or situations. The highlight of this month is Mars, the Warrior, turning to retrograde motion on June 26th. He will be retrograde for all of July and most of August, returning all the way back to 28 degrees Capricorn before returning to direct motion. Mars retrograde may slow down our forward movement in our life situations. However, as with all retrogrades, this is for a good reason. This will give us the time to decide if we are moving in the right direction. It will give us a chance to see if there are any other opportunities to be experienced, or if we need to connect with others to further our goals, either personally or for the collective of humanity. On June 27th – 28th, depending on what part of the world you reside, we have a Full Moon at 6 degrees Capricorn. This Full Moon connects with Saturn, the Great Teacher, at 5 degrees Capricorn and Uranus, the Great Awakener, at 1 degree of Taurus. Because Saturn has a restrictive quality and Uranus has an innovative quality these energies do not seem to go together. However, the connection between Saturn and Uranus is a positive one so this may assist us in manifesting the first steps towards a bridging between the old 3rd-dimensional paradigm with the new 5th-dimensional paradigm of energy on the planet. We end the month’s energy, June 28th – 30th, with Mercury, the Messenger, moving into fire sign Leo and forming a challenging relationship with Uranus in earth sign Taurus. This will create unexpected, challenging verbal interactions from people and a feeling of not being able to filter what is being communicated. Mercury in Leo is a strong and confident energy and people will not likely hold back from expressing their truth, especially with the connection to rebellious Uranus. Remember with the Star Card Vibration this month, it is a time to hope, plan, and dream for the future. Shoot for the Stars, and keep moving forward towards your most positive intentions! 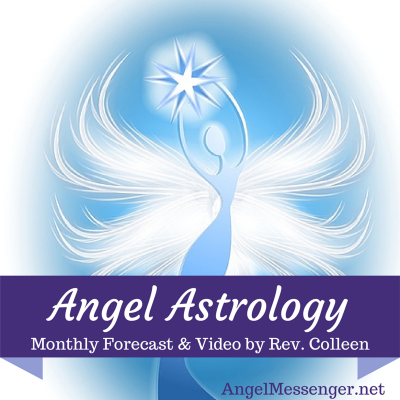 Please be sure to watch the Monthly Angel Card Reading Video for June 2018 below and watch my weekly readings on my YouTube channel, Angel Messenger website, or on my Facebook page to hear what messages our angels and guides share with us for the upcoming month!